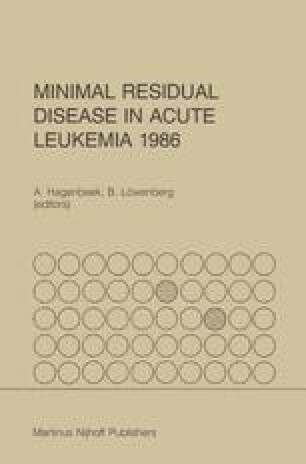 The first cytogenetic aberration associated with leukemia has been reported more than 25 years ago, i.e. the Philadelphia (Ph) chromosome in chronic myeloid leukemia (CML) (1). At the present time, it appears that most, if not all cases of acute leukemia are characterized by cytogenetic changes which follow a non-random pattern of occurrence (2,3). Almost every month, a new translocation or chromosomal rearrangement is described as specifically associated with a subtype of leukemia with characteristic clinical, pathological and immunological features (Table I) (3–7). In contrast with the immunological markers which are differentiation markers that appear also on some normal cells, cytogenetic markers are unique and specific features of leukemic cells. It may be expected within a few years that a chromosomal classification of hematological malignancies will develop next to the FAB classification presently in use (8,9).